While the Competition titles may have fallen flat this year, NEXT, a portion of the Sundance Film Festival that has produced adventurous, breathtaking works in the past, delivered yet again. If you ever find yourself coming to Sundance, you simply must make time for NEXT. It’s the place to be, frontlined by the incredible “A Ghost Story,” from director David Lowery, and including other buzzed titles from this year like “Lemon,” “Menashe,” and more. Two of my favorite films of Sundance 2017 premiered in the program—a razor-sharp horror/satire that plays like an update of “Heavenly Creatures” for the era of the Kardashians and an elegiac study of two people crossing paths and influencing each other’s trajectories from a famous video essayist. These are both special movies. Cory Finley’s NEXT entry, the vicious comedy/thriller “Thoroughbred,” is the most stunning debut of this year’s festival, an announcement of a major new talent that is almost as vital as when Robert Eggers’ “The Witch” shocked audiences two years ago or Trey Edward Shults shook viewers with “Krisha” down at SXSW. It’s on that level in terms of debut—not only remarkable in terms of what it offers but what it says about what to expect from its writer/director in the future. Stylish and smart, “Thoroughbred” is going to have a loyal audience when it eventually gets released. Amanda (Olivia Cooke) arrives at the mansion occupied by classmate and sorta-friend Lily (Anya Taylor-Joy), who is going to tutor the young lady. Immediately, Finley amplifies tension through his visual choices. We follow Amanda around the house while she’s waiting for Lily, her soulless eyes taking everything in. Something is not quite right with Amanda. When Lily, who seems to be more chipper and “normal,” tries to get through to Amanda, we realize the depths of Amanda’s emotionless attitude. She claims to not feel normal things like joy or guilt. But, oh, she’s gotten really good at pretending, even showing Lily how to fake-cry. But she doesn’t really feel it. And Lily begins to realize that perhaps she doesn’t either. This lack of empathy or emotion becomes an issue when Lily’s cruel stepfather Mark (a vicious turn from Paul Sparks) pushes his stepdaughter too far. Amanda suggests that they do what most people do with lame horses—they put it down. Who would miss him? The girls bring in a local petty drug dealer (a fantastic performance from Anton Yelchin, one of his last) into the plan, and, well, things don’t go quite as well as you may expect. “Thoroughbred” is a mesmerizing balance of chaos and control. The film looks amazing, reflecting the opulent lifestyles of its characters, but it’s a beauty that hides an ugly core. Finley’s direction is incredibly refined and calculated, especially for a first-time director, in that it never cribs directly from other auteurs (which often happens with debut thrillers) but instead announces a fresh, original voice. It's a voice that’s not only willing to take rewarding visual chances but directs his four leads to arguably the best work of their individual careers to date. Cooke finds a chilling center to this character that I didn’t think she had; Taylor-Joy conveys so much internal monologue through her riveting eyes; Yelchin grounds the entire film as the most relatable character; and Sparks perfectly captures a man who thinks so little of his spoiled stepdaughter that he doesn’t ever consider that he should fear her. “Thoroughbred” might be the most finely-tuned film of Sundance 2017—a puzzle of a film in which every piece fits perfectly. The qualifier in the last sentence as to whether or not “Thoroughbred” is the most finely-tuned film of the festival this year exists because “Columbus” also played here. Video essayist Kogonada’s debut feature is a mesmerizing drama about, believe it or not, relationships and architecture. Bringing the eye he does to his essays, several of which you’ll find as Criterion Blu-ray extras, Kogonada and cinematographer Elisha Christian (who, interestingly when it comes to composition, has a lot of credits from the world of video games) use the architecture of Columbus, Indiana as their canvas. They set up almost-always-static shots of some of the city’s most striking buildings and then allow the human drama to play out in front of it. It is a film with precise lines that captures very imprecise human emotions. Jin (John Cho) is stuck in Columbus, a unique Midwestern city in tone and architectural style. He’s there because his father, an expert on the subject, was going to speak at a university nearby when he passed out, forced into a coma that makes it too dangerous for him to be moved. While wandering the city, Jin runs into a young woman named Casey (Haley Lu Richardson), a brilliant lady stuck in Columbus because of a parent as well. Her mother (Michelle Forbes) may not be in a coma, but bad life decisions have led Casey to believe she needs to take care of her. So she works at a library in Columbus instead of pursuing an academic career that could be laid out for her. “Columbus” is a very purposefully slow, deliberate film, especially in the first act. Casey speaks of architecture as something that can be healing and comforting—for example, the way a hospital in the city was built over a river, almost like a bridge to a happier, healthier day. Kogonada clearly feels the same way, using his frame like an architect uses his tools. Shots almost always feel composed, never captured organically, and it can take a little while to get on that rhythm, but it becomes mesmerizing once you do. And yet Kogonada’s work never feels overly stylized. He is merely finding the best angles on his backdrops, like a painter finding the best size canvas for what he wants to convey. It reminds one how few filmmakers even consider the canvas. And what happens in front of these Indiana buildings is fascinating without the gorgeous backdrops. Cho has never been better and Richardson is a revelation, giving one of the most memorable performances of the entire festival. She is brilliant and funny, and it’s easy to see why Jin wants to spend his days talking to her instead of at his father’s bedside. 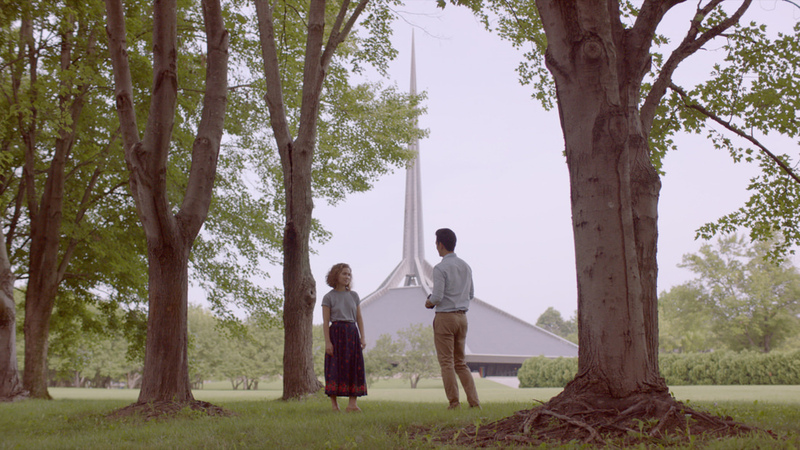 There are parts of “Columbus” that feel like one of Linklater’s “Before” films, capturing people walking and talking, impacting each other through their remarkable character instead of contrived action. “Columbus” is a remarkable film. Next Article: Sundance 2017: “Call Me By Your Name” Previous Article: Sundance 2017: "Band Aid," "Burning Sands," "Crown Heights," "Beach Rats"